Creative CBT Counselling: Creative CBT Comic #4: It's a Catastrophe! Creative CBT Comic #4: It's a Catastrophe! This comic is based off of Aaron Beck's thinking error #2: Catastrophizing (after much deliberation I kept the American spelling). When catastrophizing we predict that the future is going to be negative without considering other likely outcomes. This is a rather common thinking error and combined with other thinking errors, or alone, it can create a lot of anxiety as well as a very negative outlook and low mood. 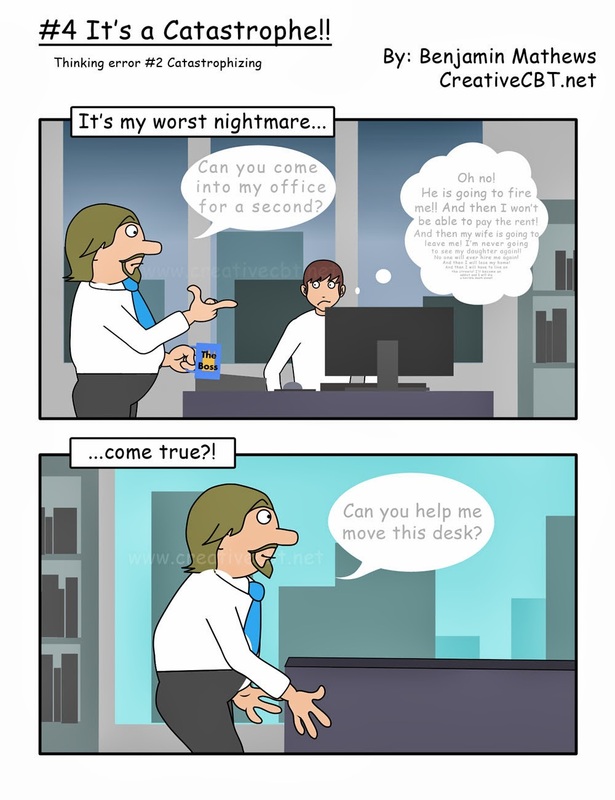 Feel free to publish these comics on your website.